"From March to May, 2001, students and teachers will follow six humans and 28 Polar Huskies into the Canadian high Arctic via the Internet. Final destination: Grise Fiord, the northernmost village in North America." School Kids Pulled Onto The Arctic Ocean By Polar Huskies. Driving up the Ice Road the international Qimuksiit 2000 expedition team of men, women and 21 powerful Polar Huskies finally arrived in Tuktoyuktuk, a small Inuit community on the coast of the Arctic Ocean late last night. Early Wednesday morning they load the heavy sleds weighing close to 1000 lbs., hitch the eager, furry dogs and head out onto the hard frozen Arctic Ocean. But they are not alone. With them are kids in the classroom around the world. As the tents where pitched, the dogs strung out around camp as the first warning in the Polar Bear defense system and the ice on the stove for tea water, the explorers pulled out the "black box" that connects them to the rest of the world. More yelling than talking, to overpower even just the slight winds still trying to blast the sides of the tent, the expedition co-leader Mille Pregont Porsild of Denmark explains how a satellite phone half the size of a shoebox and an antenna the size of a notepad is capable of beaming broadcast quality footage, images, sound, voice and of course text at 64 K. "It is better speed than most will experience in Silicone Valley!". She continues "this new A3080 system from Thrane & Thrane just released in January, is absolutely amazing. When we started working with school programs 7 years ago on our expeditions with Will Steger it was truly difficult. Back then sending a message from the ice, we would take shifts sitting outside the tent even at 50 below zero working the hand cranker to power the complicated, heavy antenna system and our computer, weighing about 50 lbs. Then we would only have a short window of about 10 minutes where the satellite was high enough in the horizon that we could actually send. Today we hit a button and we are connected with kids in Mexico City, New York, London - literately anywhere in the world from where they want to hook on. And a hook it is. "The Polar Huskies are our secret tool to reach the kids" says Paul Pregont owner of the Minnesota based organization NOMADS Adventure & Education that conduct the continues Online Classroom education programs called Qimuksiit*. "The Arctic is our blackboard and 21 powerful huskies roaring through the classroom through the lines are the irresistible grasp for students k through 12. "In 1995 when I took part in Will Steger's traverse of the Arctic Ocean" we had 1.3 million kids following us. The potential is endless. Especially as the technology gets more advanced. The challenge being to use it as a tool in the classroom, not just as entertainment. That is what we have set out to accomplish with the help of our core schools and educators. This years training expedition is the test grounds for next years 3 month journey through Nunavut (Canadian Territory of April 1999). The goal being a comprehensive interactive program using state-of-the-art technology in an easy format. Plans include the most northern live broadcast ever, live footage beamed from the head of Choko the lead dog and students around the world taking part in an online web-cast orchestrated by the Polar Husky Boss: Spank. But even this year as text and images are beamed to schools from the tent on the Arctic Ocean by the team members flocked by the native kids of Tuktoyuktuk, students worldwide are raving about not the danger or the obstacles as most would probably expect. No, it is the Polar Huskies that are the true stars. Said in short by Kathynne student from Taylor Elementary in Colorado "I like the dogs the best". This reaction does not come as a surprise to British team member Gary Rolfed "that is to be expected and just what we are looking for. Kids north, south, east or west tune into these incredible personalities and athletes - that is where the communication begins and then it just sort of rolls from there". To the question why the Arctic is especially well suited as a blackboard for internet learning a large smile spreads on Mile's face. " This is adventure with capital A, it is a remote region of the world most people know as little about as the moon - or less - and yet is so much more relevant with its people, unique culture, tons of animals and never ending thrills dished out to us by Mother Nature. Besides, it actually having great importance to our lives on the rest of the planet." * Qimuksiit [kee MOOK see it], Inuit word for: "Dogs and people working together as a team"
(Grand Marais, MN) - The Qimuksiit Mackenzie River training expedition is departing today leaving for Inuvik NWT Canada. 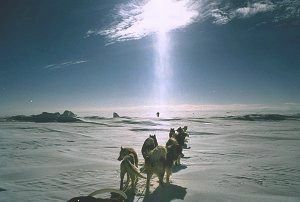 Qimuksiit (kee MOOK see it) is an Inuit word meaning "dogs and people travelling together as a unit". "We are excited to finally be departing and hope the teacher and students will enjoy reading our updates as well as gaining knowledge about this region of the Arctic." Expedition leader Paul Pregont continues "What's special about Qimuksiit is our complete focus on kids, the Polar Huskies and the native culture instead of us, the explorers! The Arctic used to be covered by two pages in a social studies textbook. Now with a laptop and the newest satellite equipment we can provide a living breathing textbook that really motivates students and get them involved". This year's expedition is in preparation of Qimuksiit 2001 - a 3 month journey to be conducted the spring of 2001. "On this "training expedition" our primary focus will be team building, Arctic travelling skills, training of dogs and testing of equipment. Furthermore we are to work closely with our "core schools" and educational advisors in preparation for the comprehensive Qimuksiit 2001 education program. Communication equipment is to be tested and as a basic journal format is to be found on the expedition web site. Finally, footage is to be shot for the first tape in a series of "Polar Husky Tales" videos" says Danish co-expedition leader Mille Pregont Porsild -- whose Minnesota-based organization, NOMADS Adventure & Education, is developing the projects. Paul and Mille Pregont, veteran Arctic explorers who were both part of Will Steger's 1995 National Geographic-sponsored Arctic Ocean traverse, are often asked why the Arctic is so important to them. Mille Pregont says, "The Arctic is one of the least understood parts of the planet, yet it affects everyone on Earth. The Arctic is basically Mother Nature's barometer. When there's a sneeze in the Arctic, the rest of the planet catches a cold. Taking into consideration what is going on with global weather systems, this is very relative". According to Paul Pregont, "What we have to do is give the next generation some real exposure to the Arctic. Of course, we as people can only do so much. 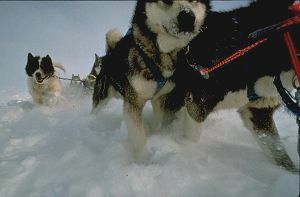 Ultimately, it's the sled dogs that get kids excited about learning." The Pregonts should know. They have made presentations with their dogs and mushing equipment at hundreds of schools over the last five years - last fall alone visiting more than 18,000 students - "There is an extraordinary relationship between kids and dogs," Pregont adds. "Kids want to learn everything they can about their personalities and roles on the trail. It's just an irresistible attraction."